The object is a metal unit housed in a blue wooden case (open in both the front and the back). 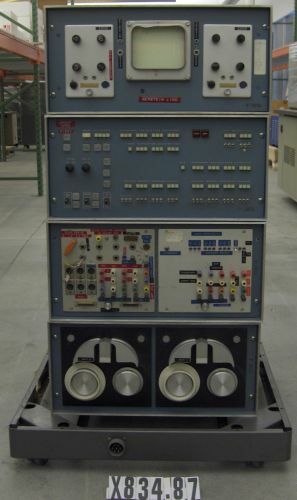 On the front of the object are various buttons, toggle switches, and knobs, which are apparently used to control biology experiments. Example labels include "CHIME ON/OFF," "INSTRUCTION LOCATION," "MEMORY ADDRESS," "RELAYS," and "SENSE SWITCHES." On a red Dymo label attached to the front of the object is "UNMOUNT TAPES FIRST" (to indicate the action to take before turning the machine on or off). On the back of the object is a detachable connector cord with the hand-written label "Keyboard." A total of 7 connections are accessible from the back of the object. Five modules are also accessible from the back of the object.